Marketing agencies and consultants can get free software and training, as well as generate traffic and leads by partnering with Databox. 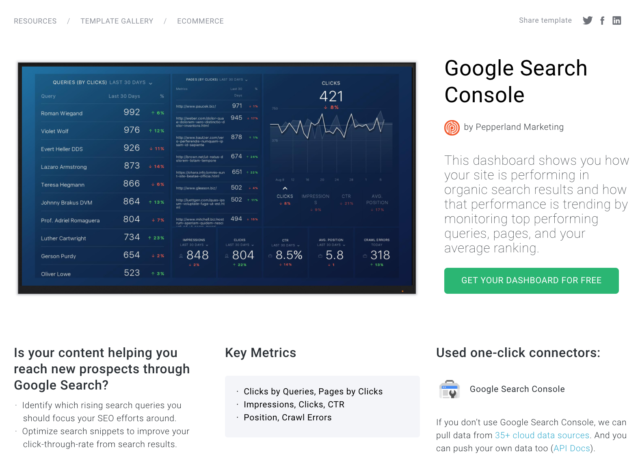 A very popular Google Search Console report template published by Pepperland Marketing to our Report Template Directory. We investigated 18 agency partner programs before launching our program. If there’s a more generous program for agencies, I haven’t seen it. Meanwhile, most companies in the BI and dashboarding space try to charge agencies more money for basic features like white-labeling and the ability to manage client accounts. In case our program sounds too good to be true, or if you think we just sound desperate, let me explain why we’ve structured the program the way we have. First, let me share some of my personal career history in the marketing agency world. When I started HubSpot’s partner program in 2008, I was a sales rep on a quota. With very few agencies who were reselling at the time, I had to sell the software to agencies (for their internal use) in order to hit my quota. 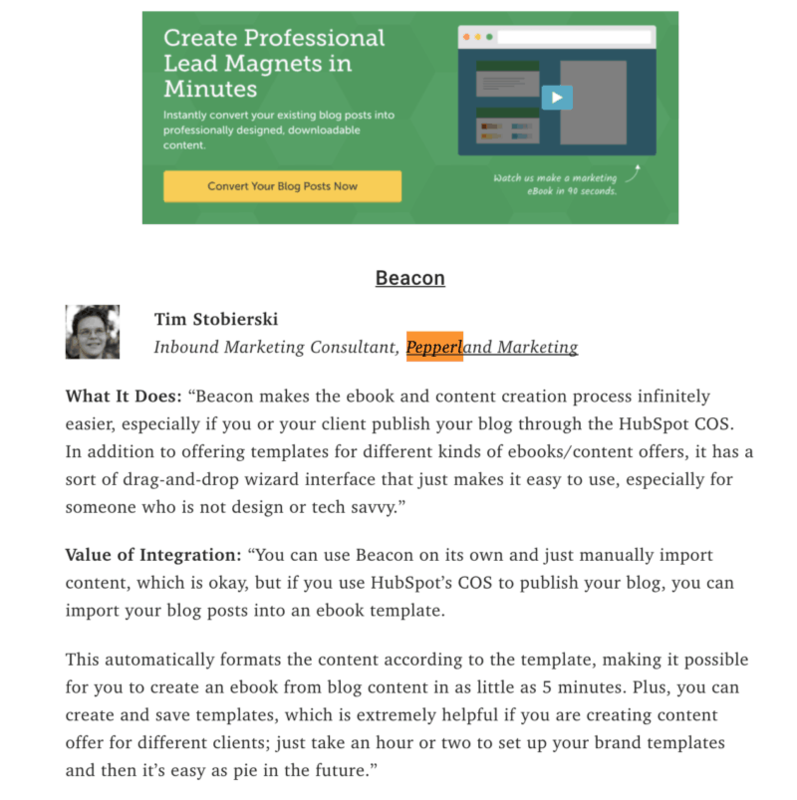 At the time, HubSpot only had one product and it was $250/mo. It was a modest investment even for the smallest of agencies. As the program gained traction, I had visions of building a program that could help 100s of thousands of agencies. Before I joined HubSpot, I sold marketing services and struggled to make payroll more than once. I was (and still am) motivated to help people who struggled like me. But as time went on, HubSpot raised prices and added most new features to new, higher-priced plans. Now, the average HubSpot marketing customer pays more than 4 times that — or to be exact, $12,773/year as of Q2 2017. As prices went up, the number of agencies who could afford HubSpot’s help went down. And since sales of the software to agencies for their own use became a large and important portion of HubSpot’s revenue, there was no way to offer the product at a lower price for smaller agencies. I wish it would have happened differently, though. With 250,000 agencies worldwide, many of them struggling to get over 5 employees (or disinterested in doing so), HubSpot could have helped many more. And those agencies could have helped many more clients. But, the jump from free user to certified to tiered partner requires a pretty steep investment. Most of the benefits for partners kick in after (1) purchasing the HubSpot Marketing Professional edition, and (2) hitting annual resale targets. Very few of the 3700 HubSpot partners, let alone the 250k+ agencies worldwide, benefit from all the goodness HubSpot provides to their top partners. I didn’t have to think long before I decided to create a very generous free plan for agencies. Below are the reasons why. At HubSpot, Halligan often asked me, “How many partners should HubSpot have?” I always answered “all of them.” Unfortunately, we didn’t get to make the strategic decisions at HubSpot that would have enabled ubiquity — the aforementioned pricing issue mentioned above being one of them. At Databox, that’s what I want to achieve. I won’t be happy with a few hundred or a few thousand partners. I want all marketing agencies worldwide to use Databox to acquire, retain and grow client accounts more easily. That’s reason number one why the program is free to join. By lowering the price of our product and our program to zero for agencies, we eliminate the friction on the path between agency awareness and partner commitment. The Databox product team has built a product that delivers value in literally minutes. Unlike most reporting and BI solutions, a company’s data can be visualized instantly in Databox. Connecting to a Company’s existing systems, choosing a report from our report gallery and customizing it (via our Designer) requires no technical skills. It is all done through point and click and drag and drop. One of the fears at any software company with both a reseller program and a direct sales team is that conflict will arise when there are too many partners. There’s a fear that all the partners will have their hands out and there won’t be enough opportunity for all of them. There’s a fear that when more partners are pursuing deals, there will be more conflict with the direct sales team. Indeed, pie pieces get smaller if the overall pie doesn’t grow fast enough or if coordination costs become too high. However, at Databox, we are in an enviable position of being able to grow our user and customer count through marketing alone. In other words, many companies find us, start using our product and then buy without any interaction with our team. I believe we can continue to grow our revenue without a direct sales team and only a low-touch, reactive support team. This low-touch model that we use creates a huge opportunity for our partners to assist our customers. I have no plans to build a direct sales team and the product team reduces support requests systematically by improving the product. Therefore, we are exclusively investing our resources in product, marketing and our partner program. All that’s left to do is: connect our customers to our partners so they can collaborate. To do that, we market together with our partners. Already, some of our partners are generating more leads from our website than their own. We also feature our partners and their report templates in our marketing. Here’s an article titled, “16 HubSpot Integrations Top Users Swear By” where we featured a quote from Tom Stobierski, also of Pepperland Marketing. As if that’s not enough, we’ve also invited our partners to submit as many guest posts as they’d like to our blog. In short, our audience is our partner’s audience, our partners are a true extension of our team, and our interests are aligned. One of my big takeaways: there’s a lot of amazing software out there used by lots of companies. Because we integrate with 50+ of the most popular SaaS services, this puts us at an interesting position to understand how well companies are using software. We’ve begun sharing that knowledge in our agency training so that agencies can help clients leverage technology to its fullest. Partners are also helping other partners. An increasing amount of our training has been built or improved by our partners. Impulse Creative even created our official integration for Teamwork Projects and is developing training on how to use it, as well as report templates so the rest of our users can start monitoring their project management data inside Databox. Each of these training modules is an opportunity for agencies to expand who they can help and how they can help them. With this training and with our Slack group, we’re building a place where agencies can collaborate as software options continue to multiply. How to Take Full Advantage of Databox’s Free Partner Program. Joining Databox’s partner program is pretty simple. Here are all the benefits and how to take advantage of each of them. Use the software for yourself: A free version of our Basic plan. This allows agencies to connect up to 10 data sources and view 10 reports for internal purposes. (Normally $59/mo.) Register here and choose “agency account” on the second screen. Use the software to report results to clients: Automate reporting for up to 10 clients with 10 of our Free Plans. Each Free plan includes 3 data sources and 3 reports. Here are instructions on creating and managing client accounts. Get listed in our partner directory: A free listing in our directory. (Agencies do need to demonstrate to us that they can use the product effectively first, of course. We can check that in 5 minutes, though.) Learn how to join here. Get exposure: The ability to create and publish report templates in our directory and link to relevant content on your website creates the opportunity to drive more qualified traffic back to your website. Get links: The ability to participate in our co-marketing where we round up quotes from experts. Bookmark this page for opportunities. Tell your story to our audience: The ability to publish an unlimited amount of guest posts to our blog. (Moz rank: 41. 15k subscribers.) Submit ideas here. Learn about popular marketing tools: Access to our live and recorded training sessions about how to leverage the 50+ tools we integrate with. Collaborate with peers: Join our Slack group for partners. Get help: If you want to request a call and we haven’t reached out to you yet, complete this form. I hope you’ll join my team.